Five people were injured and three of them had to be taken to hospital when a Delta Air Lines flight was forced to make an emergency landing due to turbulence. Passengers on Flight 5753 from Santa Ana in California to Washington said the aircraft nose-dived twice before it landed in Reno, Nevada, sending items flying around the cabin. Images and videos of the inside of the aircraft posted on Twitter show the drinks trolley on its side, personal items scattered around the cabin and liquid splattered on the ceiling. However, passengers praised the crew, who one said 'handled it perfectly'. The condition of the injured passengers is not known. 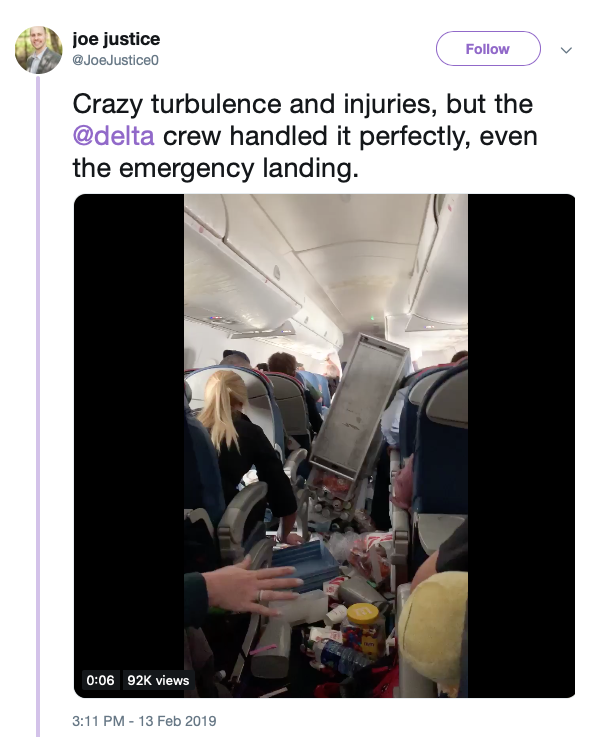 One photo from inside the aircraft, also posted on Twitter, shows a woman with a bruise on her arm and holding a napkin to her head. The flight, which was being operated by Compass Airlines, had 59 passengers and four crew members onboard. The National Weather Service had warned pilots of 'downright dangerous flying conditions with moderate to extreme turbulence'. "This is a particularly dangerous situation for aviation in the lee of the Sierra over the next few days," the weather service said on Wednesday.